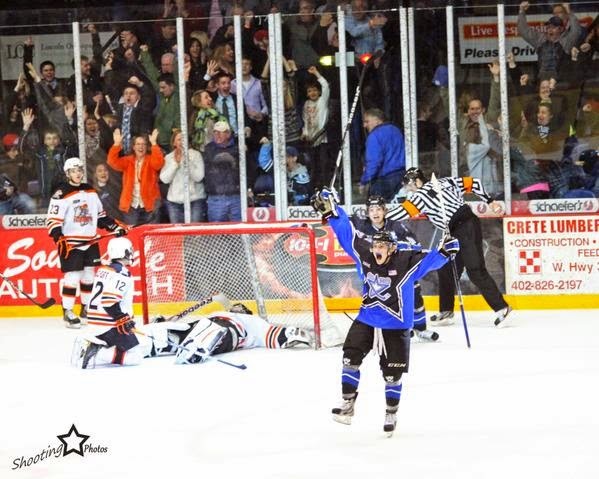 The best rivalry in all of junior hockey continues this Friday evening when the Lincoln Stars host the Omaha Lancers at the IceBox. The Stars will only play the lone home game this weekend, but it's a big one. Puck drops at 7:05pm CST for the game Friday night against the Lancers. With a record of 5-6-2 (12 points) the Lincoln Stars are in sixth place in the USHL western conference, one point ahead of the last place Omaha Lancers. The Stars are 2-0-1 in their last three games played. Click here to view the current league standings. This will be the first of eight meetings between the Stars and the Lancers during the 2014-15 regular season. The Stars' all-time record against the Lancers is 53-63-12 (Home: 31-26-8; Away: 22-37-4). Thanks to Mike Melbye for those all-time stats. As I mentioned above, the Lancers currently occupy last place in the USHL western conference with a record of 4-7-3 (11 points). Although they started the season very slow, winning only once in their first nine games played , the Lancers have rebounded a bit and are 3-1-1 in their last five games played. Still, it's odd to see the Lancers near the bottom of the standings. Most pundits expected them to be a pretty good team this season, especially considering the amount of players returning from last season, which includes 2013-14 USHL Goaltender of the Year, Hayden Hawkey. Offensively, the Lancers have really struggled to score goals so far this season. Through 14 games, Omaha has scored only 31 total goals (2.2 average per game), which is dead last in the USHL. To compare, the Stars average 3.3 goals scored through 13 games played. One player for the Lancers who has not had any trouble scoring goals is forward Shane Gersich. The University of North Dakota commit (and Washington Capitals draft pick) has racked up 15 points (10g, 5a) so far this season. His 10 goals accounts for 32% of the total goals the Lancers have scored this season. Gersich is definitely a player the Stars will need to watch closely Friday night at the IceBox. The Stars are coming off a very successful long road trip to Youngstown, OH where they earned 3 of a possible 4 points with a 5-4 OT loss last Friday against the Phantoms, and then a 4-3 OT win on Sunday. 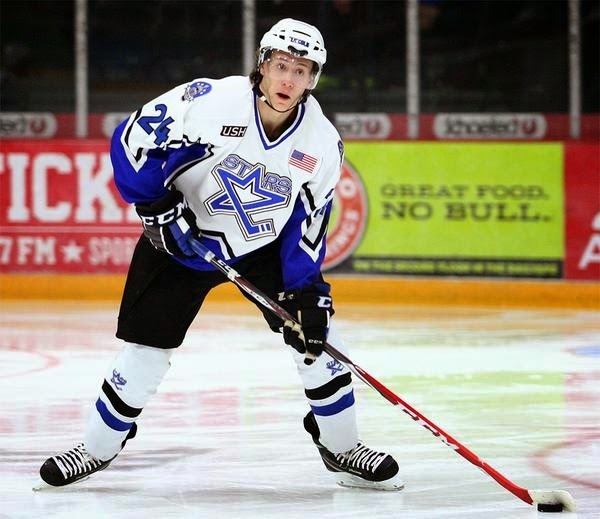 For the second time so far this season, Lincoln Stars d-man Cam Lee was named the USHL Defenseman of the Week. Cam Lee, D, Lincoln Stars: The defenseman had two points (1g, 1a) and registered a plus-seven rating in helping the Stars earn five of a possible six points in the standings during the week. He was a plus-one in Tuesday’s 5-2 victory over the Des Moines Buccaneers as the Stars snapped a three-game losing streak. The 17-year-old then scored a goal and finished with a game high plus-three rating in Friday’s 5-4 shootout loss to the Youngstown Phantoms. Lee then finished his week by dishing out an assist and again finishing with a game high plus-three rating in Sunday’s 4-3 overtime win against Youngstown. The Ferguson’s Cove, Nova Scotia native has eight points (4g, 4a) through 10 games this season, tying for 11th in scoring among USHL defensemen. He is committed to Providence College. In other news breaking this week, Lincoln Stars forward Michael Gillespie has committed to play college hockey at Ohio State University, starting the fall of 2015. Lincoln Stars forward Michael Gillespie has committed to play college hockey at Ohio State University following his USHL career. Gillespie is currently tied for the team lead with 11 points (9g, 2a) in 13 games for the Stars this season. His nine goals are tied for the sixth-most overall in the USHL. The 18-year-old has netted eight goals over his last nine games. 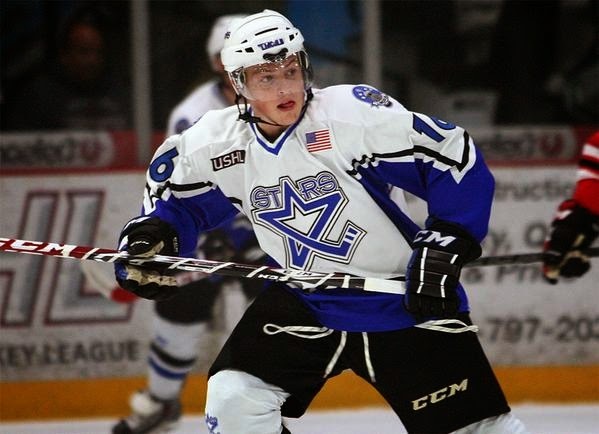 The New City, New York native came to the Stars after being selected by the team in Phase Two of the 2014 USHL Draft. He previously played for the New Jersey Rockets and New York Saints hockey programs. Last year, he was named the EHL Rookie of the Year while playing for the Rockets. Gillespie is joined by Stars teammate Miguel Fidler who is also committed to Ohio State University. World War III kicks off tomorrow night in front of what will hopefully be a sellout IceBox crowd. No matter where each team is at in the standings, these battles between the Stars and the Lancers are always epic. Can't wait to see another one in person.